An identity document used Venezuelan citizens to gain access to the government’s social services and several other benefits is one of Maduro regime’s most powerful tools. 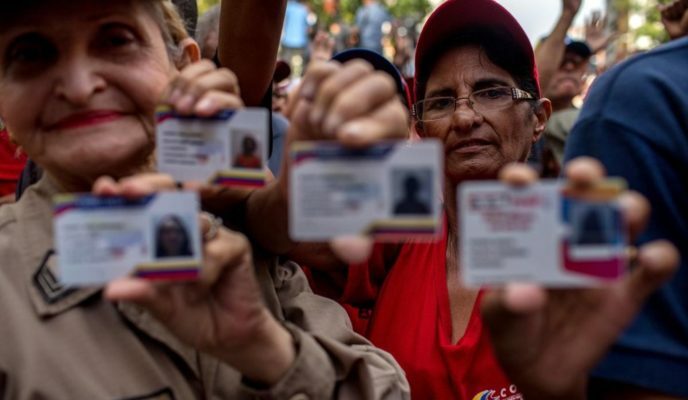 Increasingly dependent on subsidized food and medications, amidst the economic collapse and the humanitarian crisis promoted by the Chavista regime, Venezuelans must use the Carnet de la Patria (Fatherland Card), which has become a powerful way on maintaining social and political control. A study estimates that around 70 percent of the population uses the card, according to Benigno Alarcón, director of the Center for Political and Government Studies at the Andrés Bello Catholic University, in the Venezuelan capital, Caracas. “Especially among the poorer and more vulnerable sectors, precisely because they are the ones most easily manipulated and pressured regarding issues such as food and basic needs,” Alarcón told Gazeta do Povo. “In reality, the card’s main function is to keep a tight grip on the state’s 2.8 million employees and also on the millions of people seeking government assistance, many of whose livelihoods depend on it,” wrote Ryan Brading, a researcher at the Department of Development Studies of the SOAS, University of London. The Fatherland Card functions a bit like the “libretas de racionamiento” (“rationing coupons”), which were used in Cuba. Without it, Venezuelans can’t have access to health services, vote, study in universities, or obtain the subsidized food they need so much, which are offered by the Local Supply and Production Committees (CLAP), in a basket containing basic items such as rice, beans, flour, and oil. Since most Venezuelans need to register themselves in that system, it is an effective way of controlling the poorer population and guaranteeing their obedience. The data of each card owner are stored in servers, and so the social programs end up helping Venezuela to maintain a state which monitors the behavior of its citizens, in a way similar to what was described in the romance 1984, by British writer George Orwell. Alarcón explains that the transactions done with the cards are registered in lists by members of the government party, and can later be used to mobilize voters. “Somehow, they know the preference of each voter, for whom they would vote at any particular moment,” he said. Knowing the personal preferences of everyone who can vote makes it possible to go to these people when an election period is getting close, and forcing them to vote. Another fact added to that strategy is the firm belief by the population that there’s no such thing as a secret vote, and that the government can always find out for whom each citizen voted. Although that is not true, the population believes this information, since the government makes no effort to deny it. The technology for this monitoring system came from China. One Reuters report shows how Chinese telecommunications giant ZTE is at the heart of the Venezuelan Fatherland Card. The ZTE local director in Caracas confirmed that the company sold servers for the database, and was developing the mobile payment application. Critics say that the Fatherland Card illustrates how China, through companies allied to the state, such as ZTE, is exporting technology that might help allied governments to track down, reward and punish their citizens. The secretary-general of the Venezuelan party Acción Democrática, Henry Ramos Allup, questioned the imposition of the Fatherland Card as a control mechanism to gain access to social policies. “The government is playing with the hunger of the people by demanding their need to have the Fatherland Card to obtain food and medicine,” he criticized. Last August, Maduro announced that the country’s extraordinary subsidies for gas and diesel would only be available for those who had the Fatherland Card. All others would have to pay “international prices” for that which has long been the world’s cheapest gas, so cheap it was actually almost free. Maduro also used the system on his behalf during the 2018 presidential elections. He bought votes by distributing houses and using the Fatherland Card as a bargaining chip. Before the voting, several media outlets broadcast a speech in which the dictator claimed that “all those who have the fatherland card must vote, it is in giving that we receive.” “I am considering giving away prizes to the people of Venezuela who go out to vote on the election day with the Fatherland Card,” he continued during a rally in the state of Anzoátegui. On the election day, more irregularities. The network of national observers pointed out the presence of “red points” in the vicinity, and even inside the voting stations. Many of them reported the demand for a Fatherland Card from the station coordinators, chairmen, and members of the PSUV party, before allowing people to vote. Besides all that, Maduro didn’t allow international observers to accompany the elections, as it usually happens in democracies. On the day of the elections for the National Constituent Assembly, an organ which now stands over all branches of government, Nicolás Maduro was the first to vote. Shortly after 6 am on July 30, 2017, the mandatary presented his Fatherland Card to verify his vote, but the following message showed up in the device which read the cards: “Nonexistent person or annulled card.” The moment was broadcast live on state television channel VTV.